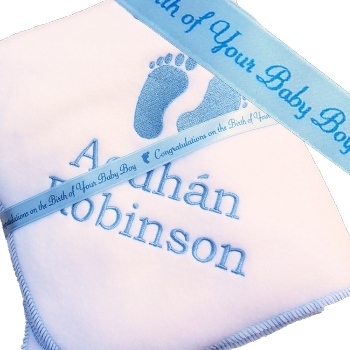 White fleece baby blanket with embroidered motif and name presented with a personalised ribbon tied around to make this gift extra special. Unisex pram size fleece blanket at 75 x 100cm. Lovely quality anitpil polyester polar fleece in soft white. Sewn with a overcast blanket stitch edge in a matching thread colour to the embroidered motif of your choice and personalised name. Can be sewn in a thread colour for a boy or girl. You choose a thread colour and letter font style for the personalised text and motif. Enter the name or name and DOB you want embroidered on the blanket. Choose from our selection of embroidery motifs (baby feet, heart, star, crescent moon, cross, sunshine, baby rattle).